It’s no secret that marathon training requires on-point nutrition. And at no time is it more important than in the days leading up to race day. When you travel to run a marathon out-of-town — like I did recently — things get even trickier. Marathoners tend to be a pretty superstitious crew, and marathon week often involves a series of rituals when it comes to nutrition. And it’s for good reason! Nutritional missteps won’t just hurt your performance; they could lead to serious digestive issues at the worst possible time — mid-marathon. So, as you can imagine, traveling to a marathon is significantly more stressful than running one locally. For months you’ve trained for this day — and as if the stakes weren’t already high enough during race week — add in a flight or two, a long car ride, an unfamiliar room in an unfamiliar town, and restaurants you’ve never been to before and it becomes super easy to let yourself get really off-track. 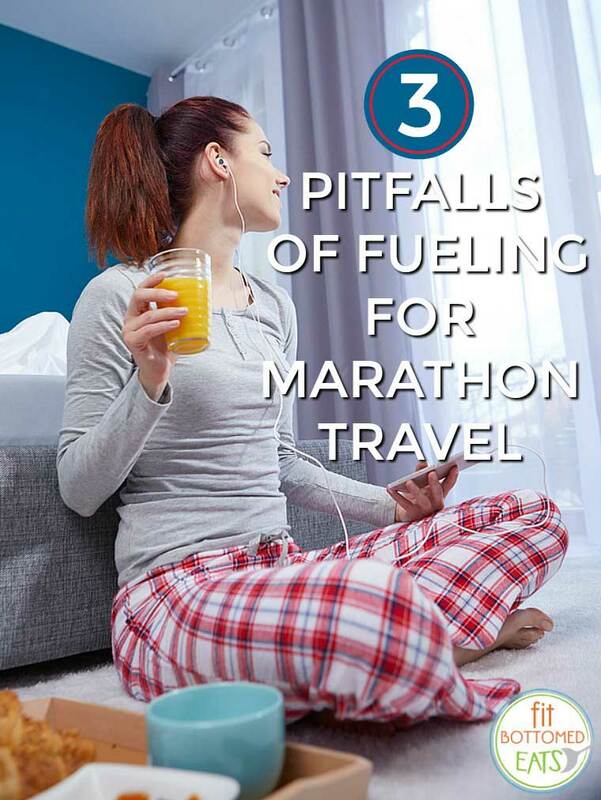 Here are the three big nutritional land mines I’ve encountered while traveling for a marathon. Not eating on a regular schedule. Traveling is an adventure. It’s really easy to get distracted and forget to eat on your regular schedule. Routine in marathon training nutrition is important. When I’m at home, I prefer to eat my larger, more carb-o-riffic meal at lunchtime the day before the marathon instead of at night so my full belly doesn’t keep me from getting a good night’s sleep. But when I’m traveling and exploring the city, in all the excitement I tend to forget to eat until dinner and then I overdo it. My advice: set a meal alarm and stick to it. I know you want to see sights, but be sure to keep your meals regular while you’re getting your tourist game on. Not hydrating well in order to avoid excessive bathroom trips. Look, I get it. Nothing is more annoying than having to take a trip to the bathroom every 30 minutes during a flight or road trip — no one wants to be “that person.” It’s tempting to avoid drinking much water in an effort to limit bathroom breaks. But hydration during the entire week before your race is critical. It’s a delicate balance between drinking enough to be well hydrated and drinking so much that you’re running to the bathroom over and over. My advice: hydrate well — except in the window of 2 hours before your flight or car trip. Then during the trip, hydrate consistently but not excessively. Once you arrive, get right back to staying on top of your hydration. Sure, it may mean more bathroom trips, but it’s better than the alternative. Another pro tip: if you’re flying, book the aisle seat so bathroom access is a bit easier. Trying new things. First rule of marathoning is nothing new right before the race. But that’s really hard to do when you’re traveling to an unfamiliar city. A certain amount of newness is unavoidable in this case. My advice: stick to cuisines and dishes that you are familiar with and have tested out prior to your long training runs. Save the new stuff and the local “dives” for after the race when digestive distress is less … um, problematic.